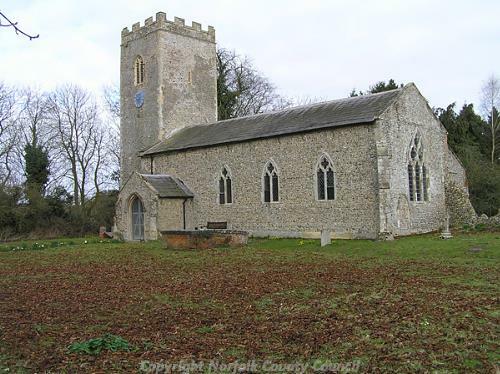 Thurning is a small parish situated some 15km east of Fakenham, in the North Norfolk Local Government District. The parish has an area of some 644 hectares, as well as a small village situated on the Reepham Road. The name ‘Thurning’ is thought to derive from the Old English for thorn bush, implying that this is either the place of thorn bushes, or the people of thorn bushes. The earliest recorded monument is a prehistoric burnt mound (NHER 3121), situated close by the site of an undated ring ditch, linear feature and field systems (NHER 12851) just to the west of the village. 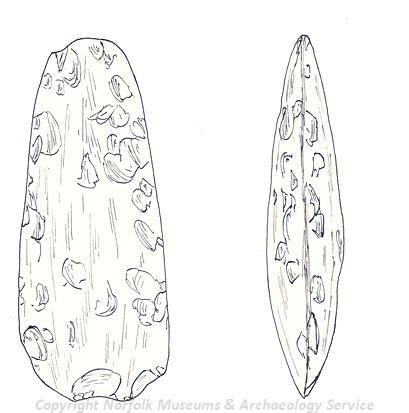 In addition, a number of prehistoric flints, including Mesolithic (NHER 34364) and Neolithic flakes (NHER 34366) and a Neolithic polished flint axehead (NHER 3121) have been recovered. Although no Roman period monuments have been recorded, a small number of objects have been discovered. These include pottery sherds (NHER 13079, NHER 13080), as well as coins (NHER 34364) and brooches (NHER 34366, NHER 34365). A small number of Saxon objects, that include a pair of Late Saxon tweezers (NHER 13080), a complete Middle Saxon pin (NHER 34364), and a possible 8th century brooch (NHER 34366). 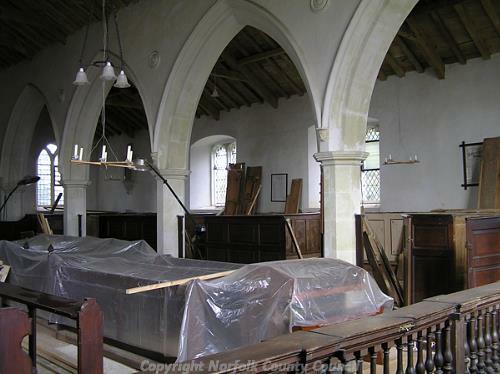 The parish is referred to in the Domesday Book, although no Saxon period monuments have been recorded. However, by 1300 the majority of the current structure of St Andrew’s Church (NHER 3130) had been built, with indicative y-tracery still visible in the north aisle and west tower. The nave south windows were produced in an early, reticulated Decorated style, and inside there are a number of splendid dark wood pews, rails and panels originally made by Burrough in 1742 for Corpus Christi College Chapel. A small number of medieval objects have also been recovered. These include pottery sherds (NHER 13079), coins (NHER 34365, NHER 34364), a 13th century copper alloy seal matrix (NHER 34275), an unfinished 13th century lead seal matrix (NHER 34365), and a number of objects such as buckles, harness pendants and vessel fragments (NHER 34366). A similar range of post medieval objects have also been found. There are also a number of post medieval buildings of architectural interest. One of the largest is Thurning Hall (NHER 3125), a mid 18th century building of red and blue brick, stuccoed around 1830. Also of interest is Manor Farmhouse (NHER 13122), a late 17th or early 18th century farmhouse, as well as Craymerbeck House (NHER 47611), a structure of the 17th century. From more recent history, the line of the Midland and Great Northern Joint Railway (NHER 13581) also crosses the north of the parish. The line no longer operates, but some of the route survives as footpaths, and buildings originally associated with the line are also still present.